We know our readers love WallRock. No glass fibres, no PVC and no toxins, but still one of the strongest and highest performing thermal papers in the market. Wallrock goes on like wallpaper and can be installed yourself. It prevents heat escaping through walls, prevents condensation and helps muffle sound. It is just over 3mm thick and is a smooth, plain white finish that can be decorated over as you choose. These products are cheap, quick to fit and will hardly increase the width of your walls – unlike other materials, which are typically 100mm thick. The problem, however, is that there are a lot of different options and it can get pretty darn confusing. That’s why we’re here to provide a basic guide to the different types of Wallrock liners and what they all do. Best for: Good all rounder – improves the warmth of rooms in the home, while offering increased acoustic insulation and also covering any cracks in the wall. Wallrock thermal liner has been specially designed to increase the energy efficiency of the home without having to give up too much space. Unlike traditional internal wall insulation that can be as much as 100mm thick, this Wallrock liner is just 3.2mm thick – however it still will significantly increase the energy efficiency of a room – helping to lower your energy bills. The 3.2mm Liner needs to be attached to the walls with the special Wallrock Adhesive, providing instant energy saving properties which will help lower your energy bills (savings are dependant on the type of wall you are attaching the liner to and the outside temperature). Not only does it slow the movement of heat out of the home, it also works well as acoustic insulation and also it is excellent for covering damaged and textured walls (provided it is simply cosmetic damage). The Wallrock Thermal Liner is also breathable, helping to combat the growth of mould. Best for: Blocking unsightly damp and associated stains while warming the room. Wallrock Dampstop Thermic is a zero paper content, zero tar content product available at a very competitive price. Rather than using paper based material, it utilises a very tough, strong, rot proof and salt resistant polypropylene backing that will give a long service life even in very challenging conditions, bonded to a water resistant composite metallic barrier. Applied directly to the wall, the Dampstop Thermic effectively blocks off the appearance of unsightly penetrating damp and staining. The metallic surface can then be covered with paint, one of the range’s thermally efficient wallcoverings, wall lining, or decorative paper. Not only does it stop the unsightly damp and associated stains, if the composite, thermic, metallic surface is left exposed, it will also greatly enhance the reflection of heat into the room – making the product especially useful in improving energy efficiency in the home when used behind radiators and appliances. Best for: Covering and smoothing old walls while making them fire resistant. A ‘Class Zero’ fire rated liner (tested to BS476) that also contains fire retardant so that fire risk is further limited, even when the paper is peeling or has been applied over normally flammable surfaces. Wallrock Fireliner is as easy to hang as any other wallpaper and it will last for years to come. It can also be used to add fire protection to cracked and damaged surfaces and can be used alone or over Wallrock Thermal Liner. Best for: The Big Brother of the standard Wallrock Thermal Liner, the KV600 is 25% thicker and offers significantly improved heat retention properties. If you are looking to have increased thermal properties you may wish to look at our Wallrock KV600 Thermal Liner, which is 25% thicker than the standard Wallrock Thermal Liner. The Wallrock KV600 thermal liner is 4mm thick, making it the perfect solution to help improve the warmth of rooms in the home, whilst also offering increased acoustic insulation and the ability to cover cosmetic cracks in the wall. One roll of Wallrock KV600 will cover a wall / ceiling area of 15m2. 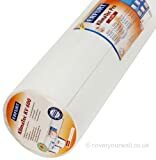 Designed specifically to increase the energy efficiency of the home without taking up too much space, Wallrock Thermal Liner can be applied as a DIY job. Wallrock KV600 thermal liner is perfect for covering cosmetic cracks on your walls. Old buildings move as they warm and cool during the year, which can create unsightly cracks forming across the plasterboard. Wallrock is made from short wood pulp fibres combined with long and durable textile fibres, which means the liner can move with building and hide these cracks. The Wallrock KV600 Thermal Liner not only covers more space than the standard Wallrock Thermal Liner (15m2 compared with 7.5m2), but the roll is wider (1m),therefore creating less joins and creating a better finish. Best for: Finishing the product to the best specifications, preventing cracking and protecting your thermal liner. Wallrock Fibreliner is a multi-purpose finish liner, which can be used to cover up cracks or create a beautifully smooth finish when applied over another Wallrock liner product. Wallrock liner is a roll of material that delivers a perfect result when placed over Wallrock KV600 insulating wallpaper or when quickly covering up rough and damaged surfaces with long lasting results. When not used in conjunction with KV600 it can cover up and reinforce damaged plaster, cracked render and more. This Wallrock liner is possibly the toughest wallcovering on the market. The Cellulose-textile fibre gives it extra strength, which makes it the number one choice when a durable finish is required. It is also B1 fire rated, meaning that it is suitable for BS stipulations with wallcoverings. It is incredibly easy to hang, making the job simple and quick. All you have to do is apply paste to the wall and hang the Wallrock Fibreliner as if it was normal lining paper. Fibreliner has been specifically manufactured to be an easy to use solution for rough and damaged walls, and also provide a perfect finish to your Wallrock KV600 Thermal Liner.